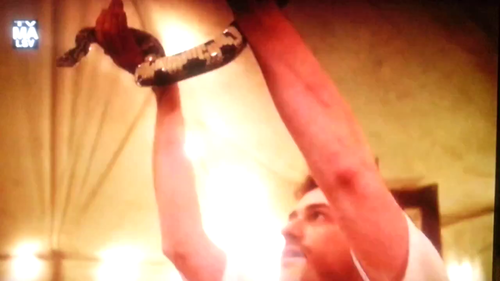 Love Joe Mazzello: Joe in the trailer for Season 4 of "Justified"
Joe in the trailer for Season 4 of "Justified"
In this short trailer for the newest season of Justified, Joe can be seen in the first few seconds holding up a snake. 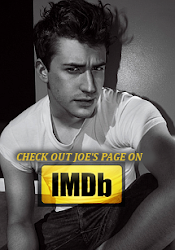 On the show, Joe plays Billy St. Cyr, a local preacher who helps residents kick their drug habits. Season 4 of Justified will premiere on Tuesday January 8th, 2013 at 10pm on FX. Justified season 4 dvd box set is averaging 4.3 million total viewers for season three, up 8 percent from season two, which ended with the death of scene-stealing holler crime maven Mags Bennett and earned a Best Supporting Actress Emmy for her portrayer, Margo Martindale.Hannibal season 1 dvd box set fans sure have a lot to, ahem, digest after the extravagant thriller's Season 1 finale, "Savoureux" — which certainly hit a high note for the series, leaving fans hungry already for Hannibal season 1 dvd box set of Bryan Fuller's moody offering. More than 3.82 million viewers watched the justified Season 4 dvd finale of Justified according to Nielsen’s Live+7 numbers. That’s a 70% jump over the 2.249 million reported in Live+Same Day for the FX‘s series’ season finale April 2. The latest final numbers put the justified Season 4 dvd finale down just 3% in total viewers from 3.95 million who watched the Season 3 ender. Overall, Season 4 was the show’s most-watched ever, pulling in an average audience of 4.008 million, up 4% over the previous two seasons and 20% over Season 1. Among adults 18-49, justified Season 4 dvd was down a slight 1% with 1.986 million in the demo compared to Season 3’s 2.007 million; the most recent season was essentially even with Season 2 and up 14% over Season 1 in the key demo. Joe in another trailer for "Justified", Season 4!